Jingle bell Jingle bell... This is what I hear nowadays when we go out. Christmas spirit is already there right from the beginning of this month. 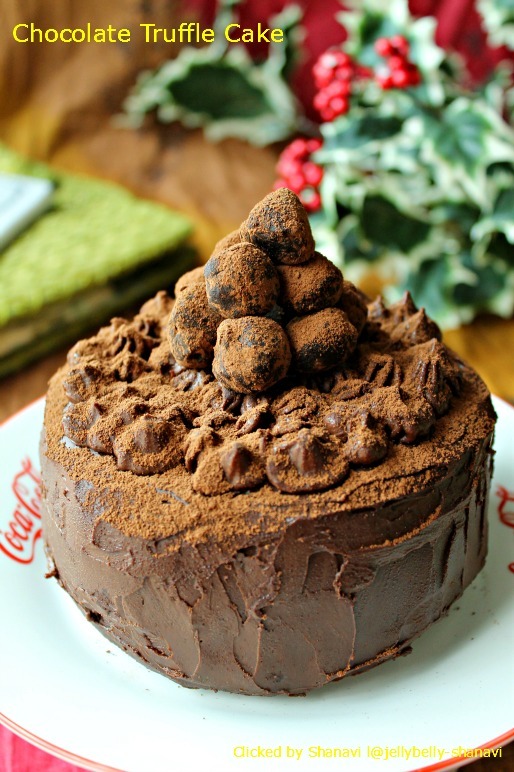 Just love it.. Chocolate Truffle cake is one of my favorites, it was there in my to -do list for a long time now. Finally made up my mind to try my hands on baking this awesome cake. 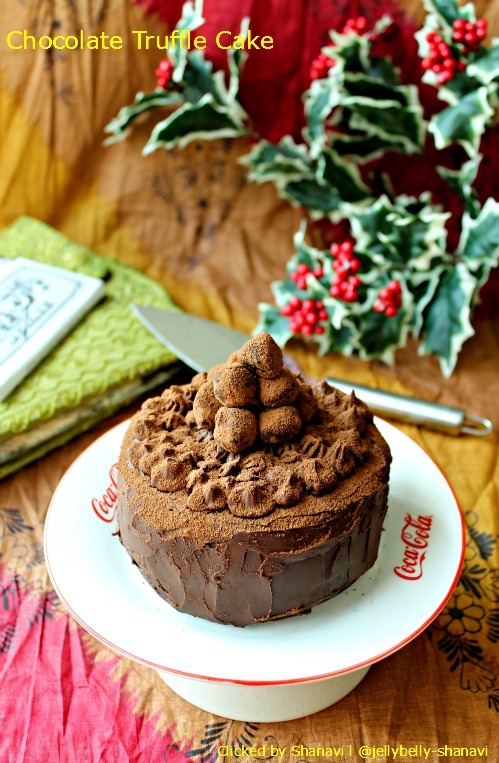 This cake is sinfully delicious..fully loaded with chocolates from start to finish. But make sure u follow the instructions carefully for making the sponge cake, that is more important in this cake. I tried piping the cakes, unfortunately I misplaced the cake in the refrigerator and my cake's top was all messy and squashy.. It happens to me all the time :( nevertheless it was one yummy cake. Cocoa powder -- 1/4 cup,to dust and roll the truffles. Preheat the oven to 180 deg C. Grease a 8" pan with butter/oil and line with parchment paper and grease the top of the paper as well. Melt the dark chocolate in a microwave or on a double boiler and bring down to room temp. Gather the 3 egg yolks + a tbsp of sugar in a bowl and beat the mixture on high speed until it becomes pale yellow and frothy. Add in the ground almonds(or walnuts),preferably sifted, to the yolk mixture and beat in a circular motion until the mixture gets double in volume. Add in the cooled chocolate mixture to the yolk mixture and continue to whisk until the chocolate is thoroughly mixed. Stir in the luke warm melted butter to the chocolate mixture. In a separate bowl whip the egg whites with the remaining sugar to soft peaks.Stir a third of the egg white mixture to the chocolate mixture in a circular motion and just fold it in. Add in the sifted flour and the remaining egg white mixture and fold it in using a circular motion again. Pour the batter to the already greased pan and smooth the top by tapping the pan and bake for 35 to 40 minutes. Remove the pan from the oven and leave it undisturbed for 10 minutes. Then remove the cake from the tin and place it on a greased wire rack to cool thoroughly. Chop the chocolate to small pieces and gather on a wide glass bowl. Add the 2 tbsp sugar to it. Heat the whipping cream,butter just enough to get a boil and pour it on top of the chocolate and sugar, leave it undisturbed for 1 minute. using a spatula,slowly stir the chocolate in a circular motion at a very low speed as we don't want air to get into the mixture.Repaeat this until u r done melting the chocolate and everything looks like a chocolate mixture. Add the vanilla essence to it and mix well. Leave it on the kitchen top for few minutes so that the ganache would start getting thicker and thicker as the time goes. After few minutes reserve some of the ganache in the refrigerator to make truffles and use the remaining for assembling the cake. It is always best to keep the ganache inside the refrigerator for a whole night to make truffles. Try to finish scooping out the truffles all @ once. U may keep the scooped out small balls of ganache inside the refrigerator for 5 minutes if u find it melting away. Store the truffles in the refrigerator until it is put to use. U may cut the cake using a sharp knife and place a big dollop of ganache ( or even more) on top of the cake and level it evenly across the cake using a spoon or whatever. Then sandwich the other part of the cake and do a crumb coat, i.e., give a light coat of ganache to the entire cake. Place the cake inside the refrigerator for 5 to 10 minutes and then do a good coat with ur remaining thickened ganache.Again keep the cake and the left over ganache, if any,in the fridge. U may whip the cooled ganache to soft peaks and use it for piping the cakes as well. 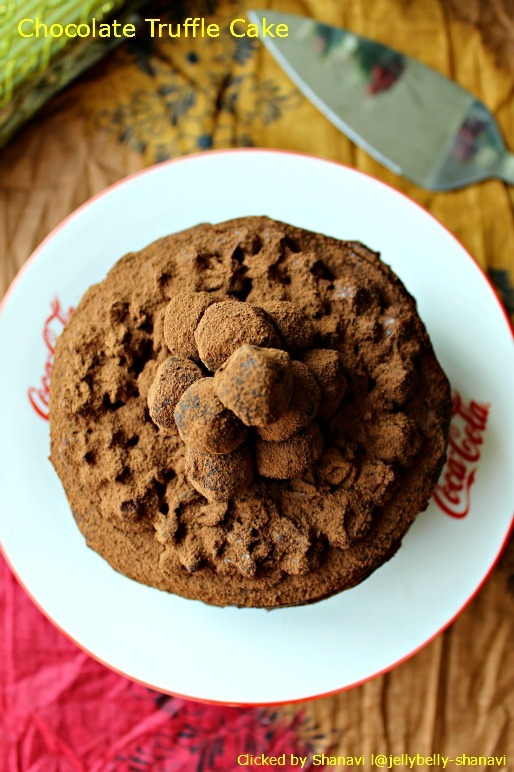 Top it off with the already made truffles and generously dust the cake with cocoa powder and serve. U may refrigerate the cake for 3 to 4 days and njoy ..
U might have lost me in the assembling part,but believe me, it's up to u, how u wanna present ur cake. I've just given more options, thatz it. keep the ganache @ room temp if u feel it is very hard. Also u may heat the ganache over a double boiler method again to make it runny. 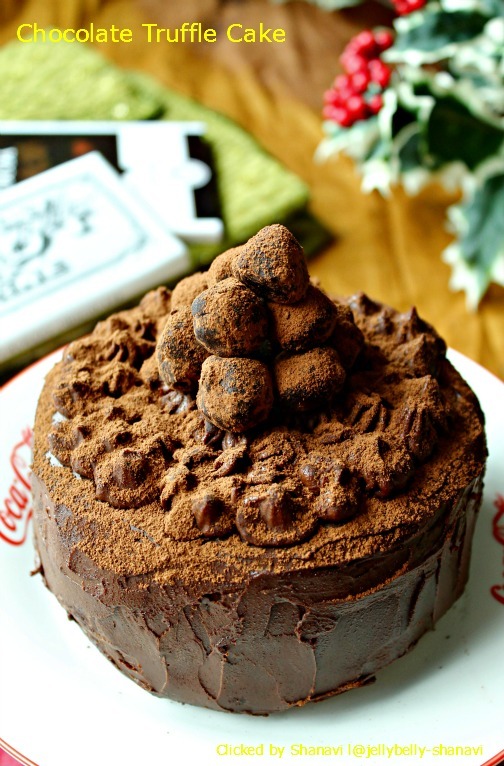 Wow wow,super like..Such an irresistible truffle cake,wish i get a slice now. Wow chocolate cake looks so tempting...Drooling here. Happy to follow u wud be glad if u can follow back. Fabulous cake, love the truffles on top! 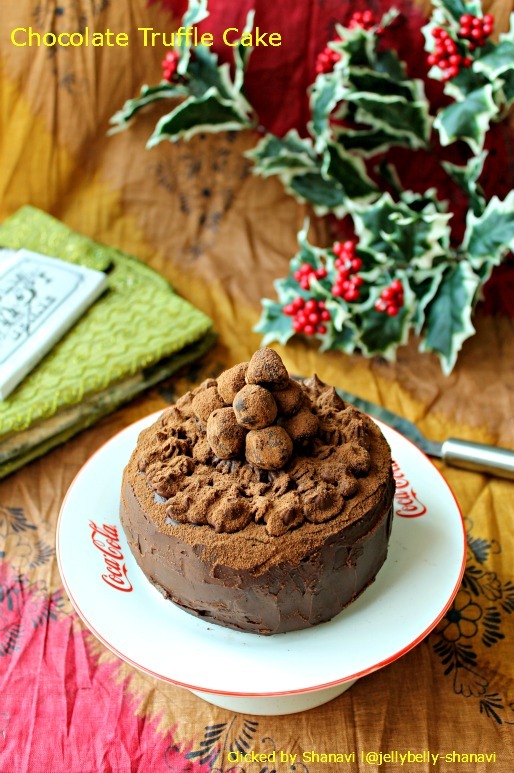 Cake looks too good.Have u dusted it with cocoa powder?